We’ve all seen Popeye, the cartoon sailor, gaining the ability to perform superhuman feats after he eats spinach. It may blow you down as the animated sailor man used to say, to discover that this has a basis in reality. With its high content of iron, vitamins, and minerals, spinach is considered to be one of the healthiest vegetables. As an added bonus, it’s also low in calories. Spinach is an excellent source of vitamins A, C, and K. Getting plenty of vitamin A in your diet improves vision, boosts the immune system, and keeps your skin healthy. The health benefits of vitamin C have been extolled for years and spinach contains plenty of vitamins. It is necessary for healthy skin, bones, and blood vessels. Vitamin K is a vitamin that is very rarely mentioned but it is essential in helping blood to clot as well as in forming bones. Taking care of your bones is important as you grow older, especially if you’re susceptible to conditions such as osteoporosis. Eating a diet that includes spinach has been shown to provide plenty of magnesium, one of the essential building blocks for strong bones, the National Osteoporosis Foundation advises. Iron is an essential part of the proteins and enzymes necessary for maintaining good health. If you lack iron in your diet, you’ll feel fatigued and suffer from decreased immunity. Spinach is an excellent source of iron, with a half cup of fresh, boiled spinach providing 18% of your recommended daily intake of iron, according to the Office of Dietary Supplements. While it goes without saying that you need oxygen to survive, it can also lead to oxidation, a process that alters the body’s chemicals so they become free radicals, causing damage to your body’s cells and even DNA. Include vegetables such as spinach in your healthy diet. This ensures that you receive plenty of antioxidants, preventing serious health risks such as cancer, heart disease, and diabetes as well as premature aging. Adding spinach as a substitute for salty and fatty meats when you order pizza is also a healthy and tasty alternative. You may think that bananas are your only dietary source of potassium, an essential part of maintaining healthy blood pressure as well as balancing out your body’s sodium level. 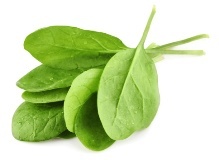 The Academy of Nutrition & Dietetics says you can add spinach to the list of foods that offers potassium. Spinach is an excellent source of fiber and it goes without saying what the main benefit of having plenty of fiber in your diet is: it keeps you regular! It should be noted that despite all the benefits of eating spinach, it’s not without its downsides. The National Digestive Diseases Information Clearinghouse advises that, because of its high content of calcium, individuals with lactose intolerance should not consume large amounts of spinach. And due to high levels of oxalate, an organic acid, eating vegetables such as spinach can also lead to the formation of kidney stones. That being said, like anything else, moderation is key. You don’t need to drink spinach smoothies, eat a spinach salad, and have grilled spinach for dinner, all in one day. But gradually adding more of this healthy food to your diet will help you out in the long run.